I’m very sad to hear that Phil Hill, one of my great heroes, has passed away. 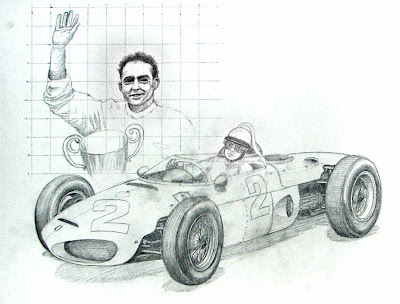 Hill had a varied racing career beginning in 1947 and stretching over 20 years. He was remarkable in winning both his first and last race outings. He won the 24 Hours of Le Mans three times for the team of Enzo Ferrari, Sebring 12 Hours three times and a host of sports car, endurance and Formula One races. He was also the fastest man in an MG, setting a land-speed record for the British firm. 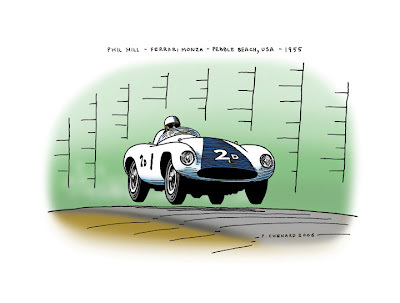 Hill was a long-time contributing editor to Road & Track Magazine. I actually never heard of him until I started reading his Salon features in Road & Track magazine. 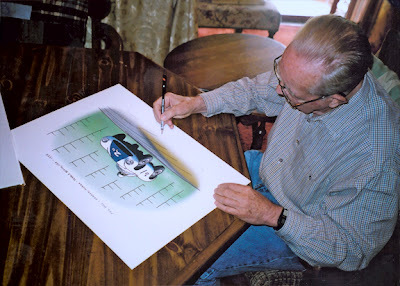 His articulate and retrospective analysis’s actually nurtured my curiosity in the history of motor sports, and pushed me to find out more, to read as much as I could on the subject. That’s when I really learned of his amazing accomplishments in a great variety of racers, and his artistry in Ferraris. 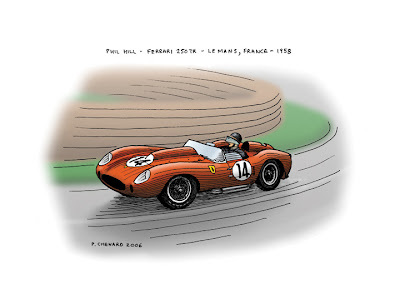 My research also showed me that no one had encapsulated his success for the Ferrari Team in art. This led me to create a series of illustrations on his wins with them. 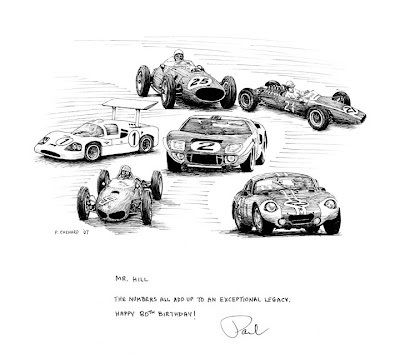 Mr Hill not only chose to feature them on his website, but also agreed to sign 100 prints of the series. 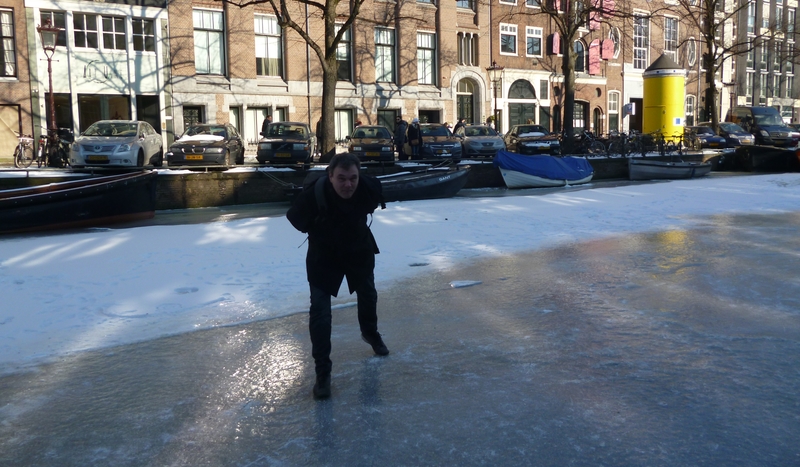 Keep in mind that this happened just over a year ago, so it was an incredibly difficult task for him. His signature was obviously effected by the Parkinsons, but he none-the-less pushed on and did the series. 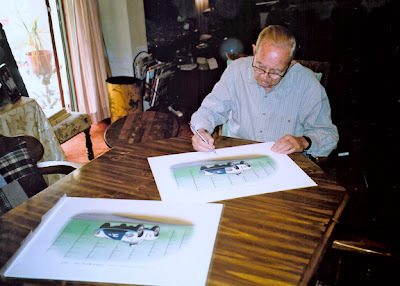 His son Derek was kind enough to take some snapshots of his dad signing, and sent them out to me, and they are now my treasured keepsakes. 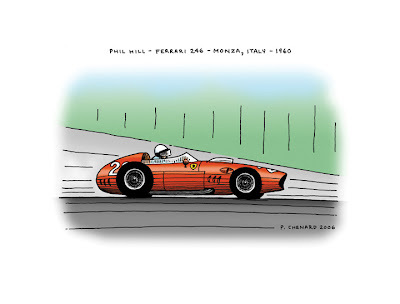 This series highlights Phil Hill's great success in Ferraris, culminating with his 1961 World Championship win. 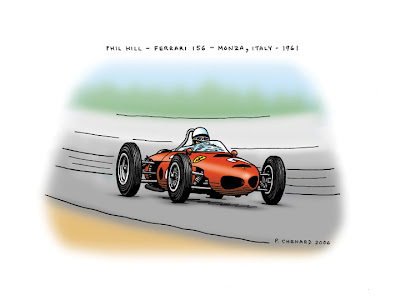 * Note: At a request of Phil Hill's Family, all Phil Hill artworks are removed from his website until sometime in November, 2008. I was in Darlington when I heard Phil had passed away. Even I, who is very new to racing, knew that someone great was lost. 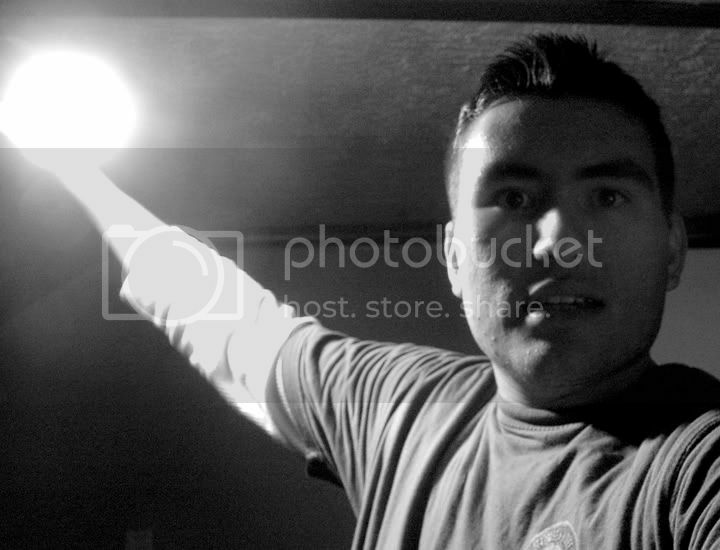 You're work continues to impress me Paul. Keep it up. Thanks for your thoughts and comments; they are very much appreciated. I'm also very saddened by the loss of this great man; he was key to my interest and research into the history of racing.